A one-club man is a sportsperson who has played his or her entire professional career with only one club. The term is often used in the context of team sports such as football or rugby. Former Roma captain Francesco Totti appeared in 786 matches for Roma over 25 seasons. 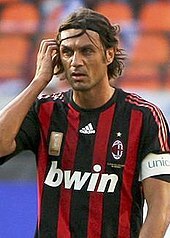 Former Milan captain Paolo Maldini appeared in 647 league matches and 902 matches overall, spanning over 25 seasons. Former Liverpool vice-captain Jamie Carragher appeared in 737 matches over 16 seasons. Manchester United midfielder Ryan Giggs appeared in more than 900 matches over 24 seasons. Barcelona captain Lionel Messi has appeared in more than 650 matches for Barcelona over 14 seasons. Roma captain Daniele De Rossi has appeared in more than 559 matches over 16 seasons. CSKA Moscow captain Igor Akinfeev has appeared in almost 600 matches over 14 seasons. Zenit goalkeeper Vyacheslav Malafeev has appeared in more than 400 matches over 17 seasons. Everton defender Tony Hibbert has appeared in 328 matches over 16 seasons. Former Tottenham Hotspur captain Ledley King appeared in 321 matches over 14 seasons. Melbourne Victory FC vice-captain Leigh Broxham has appeared in more than 250 matches over 12 seasons. Hannover 96 defender Steve Cherundolo appeared in more than 400 matches over 16 seasons. Players must have been at their club for a minimum of ten years in order to be included here. Loan spells at other teams disqualify players from being counted in the list. Only seasons with appearances in the senior first team are counted. Current players who have been at their club since 2009 will be eligible for inclusion in summer 2019. Juan Enrique Hayes Argentina Rosario Central 1907 1926 19 ? Active as of 16 March 2019, 01:43 GMT. Santiago Bernabéu spent his entire playing and managerial career with Real Madrid. In addition to those who spent their entire playing career with a single club, there are several examples of players remaining with a single club throughout their entire career within the professional club game — playing, coaching, management, etc. Notable examples are listed below. Bob Paisley (Liverpool): player 1939–1954; coach/physiotherapist 1954–1959; assistant manager 1959–1974; manager 1974–1983. Lajos Tichy (Budapest Honvéd): player 1953–1971; manager 1976–1982. Şeref Bey (Beşiktaş): manager 1911–1925. Hakkı Yeten (Beşiktaş): player 1931–1948; manager 1949 and 1950–1951; club president 1960–1963, 1964–1966 and 1967–1968. Süleyman Seba (Beşiktaş): player 1946–1953; club president 1984–2000. Santiago Bernabéu (Real Madrid): player 1912–1927; director/assistant manager and manager 1927–1941; club president 1943–1978. Boris Gavrilov (Shinnik Yaroslavl): player 1971–1989; assistant manager 1989–present. Bill Nicholson (Tottenham Hotspur): player 1938–1955; manager 1958–1974. Ledley King (Tottenham Hotspur): player 1999–2012; club ambassador 2012–present. Lev Yashin (Dynamo Moscow): player 1949–1971; club administration 1971–1990. Ryan Giggs (Manchester United): player 1990–2014; player-coach 2013–2014; player-manager 2014; assistant manager 2014–2016. Cosme Damião (Benfica): football player 1904–1916 (main squad 1907–1916); field hockey player; manager 1908–1926 (player-coach 1908–1916); director of the club's sports newspaper 1913–1931; stage director of the club's theatrical group (1916); president of the club's General Assembly 1931–1935. Joe Bacuzzi (Fulham): player 1935–1956; reserve team coach 1956–1965. Gerard Meijer (Feyenoord): physiotherapist 1959–2009. Giacinto Facchetti (Inter Milan): technical director, board member, worldwide ambassador, vice president, and president (2004–2006). Willie Miller (Aberdeen): player 1972–1990; coach 1990–1992; manager 1992–1995; director of football 2004–2012. Antoon Verlegh (NAC Breda): player 1912–1931; manager, chairman, chairman of honour 1931–1960. Roy Sproson (Port Vale): player 1949–1972 and manager 1974–1977. Vadym Sosnykhin (Dynamo Kyiv): player 1960–1973; youth-team coach 1974–1991; veterans team director 1992–2003. Andriy Tsvik (Stal Alchevsk): player 1987–2005; reserves coach 2005–2007; assistant manager 2007–present. Josu Urrutia (Athletic Bilbao): player 1987–2003; club president 2011–2018. Michael Angerschmid (SV Ried): player 1992–2006; reserves coach 2007–2012; assistant manager 2008–2012; manager 2012–present. Carles Puyol (Barcelona): player 1999–2014; assistant of director of football 2014, and resign in the same year. Ross Caven (Queen's Park): player 1982–2002; director 2001–present. Les Hart (Bury): player 1936–1953; Coach/Physio 1954–1968; Manager 1969–1971; Physio 1972–1980. Hussein Saeed (Al-Talaba): player 1975–1990; manager 1992; vice-president 1985–1992. John Greig (Rangers FC): player 1961–1978; manager 1978–1983; director 2003–2011; honorary life president 2015–present. Anatoly Ilyin (Spartak Moscow): player 1949-1962; youth coach 1962-1995. In 2015, the Spanish club Athletic Bilbao (who place particular importance on player loyalty and promotion from within), introduced an annual 'One club man award' to be presented to one retired player (excluding their own) who represented those values during their career. ^ Appeared in a one-off sponsored event for Cork Celtic six years after he retired in 1972. He was told by his sponsor Adidas that this a charity match. However, it turned out to be an official League of Ireland match. ^ "Europe's rare breed – the one-club man". UEFA.com. 11 February 2014. ^ "Monday Maul - A tribute to a dying breed: The one-club man". ESPN. 11 May 2015. ^ "Ángel Allegri profile" (in Spanish). BDFA. Retrieved 25 October 2010. ^ "Altinordu Fk". Altinordu.org.tr. Retrieved 19 January 2014. ^ "İsmail Arca (Eskişehirspor) @". Mackolik.com. 5 September 1948. Retrieved 13 August 2012. ^ "Burhan Atak". turksports.net. 1 January 1970. Retrieved 5 May 2013. ^ "Eşfak Aykaç (Galatasaray) @". Mackolik.com. 1 January 1910. Retrieved 13 August 2012. ^ Kusina, Maciej. "Piotr Banasiak". 90minut.pl. Retrieved 20 January 2018. ^ a b c d e f g Jones, Trefor (1996). The Watford Football Club Illustrated Who's Who. ISBN 0-9527458-0-1. ^ "Tarihte Bugün". Galatasaray.org. 1 January 1970. Retrieved 13 August 2012. ^ "Fikri Beşiroğlu (Vefa) @". Mackolik.com. 1 January 1943. Retrieved 13 August 2012. ^ a b Simpson, Ray (1996). The Clarets Collection 1946–1996. Burnley FC. pp. 32–33. ISBN 0-9521799-0-3. ^ "Remus Câmpeanu profile" (in Romanian). clujeanul.gandul.info. Retrieved 25 July 2008. ^ "Necdet Cici (Galatasaray) @". Mackolik.com. 1 January 1913. Retrieved 13 August 2012. ^ "Rahmi Denizöz (Vefa) @". Mackolik.com. 1 January 1928. Retrieved 13 August 2012. ^ "Halit Deringör". Mackolik.com. Retrieved 2 August 2018. ^ "Necmi Erdoğdu (Galatasaray) @". Mackolik.com. 1 January 1925. Retrieved 13 August 2012. ^ "Rober Isaac Eryol (Galatasaray) @". Mackolik.com. 21 December 1930. Retrieved 13 August 2012. ^ "The surgeon has died". romani-adevarati.ro. Archived from the original on 2 June 2008. Retrieved 22 May 2008. ^ "Zeki Gökbora (Vefa) @". Mackolik.com. 1 January 1922. Retrieved 13 August 2012. ^ "Galip Haktanır (Vefa) @". Mackolik.com. 1 January 1921. Retrieved 13 August 2012. ^ "Tony Hibbert | Everton Football Club". www.evertonfc.com. Retrieved 29 May 2018. ^ "Saim İdemen (Vefa) @". Mackolik.com. 1 January 1913. Retrieved 13 August 2012. ^ a b Walsh, Kristian (14 February 2014). "One-club men - the four Everton FC players who stayed loyal". liverpoolecho. Retrieved 29 May 2018. ^ "11.11 Евгений Капов: "Завершаю карьеру" | Официальный сайт футбольного клуба". Fcdnepr.by. Archived from the original on 23 October 2013. Retrieved 19 January 2014. ^ "Mustafa Kefeli (Vefa) @". Mackolik.com. 1 January 1914. Retrieved 13 August 2012. ^ "Kherhadze Dzhemal Noevich". Web.archive.org. 6 June 2011. Archived from the original on 6 June 2011. Retrieved 20 January 2018. ^ "Mehmet Kızılgül (Vefa) @". Mackolik.com. 1 January 1917. Retrieved 13 August 2012. ^ "Muhteşem Kural (Vefa) @". Mackolik.com. 1 January 1913. Retrieved 13 August 2012. ^ "Avni Kurgan (Galatasaray) @". Mackolik.com. 1 January 1910. Retrieved 13 August 2012. ^ "Brian Labone". Everton F.C. Retrieved 19 October 2016. ^ "McAllister's profile at Neil Brown's statistical website". Neilbrown.newcastlefans.com. Retrieved 19 January 2014. ^ "Coşkun Özarı (Galatasaray) @". Mackolik.com. 1 January 1910. Retrieved 2 October 2013. ^ "Muslihittin Peykoğlu (Galatasaray SK) @". Mackolik.com. 1 January 1912. Retrieved 13 August 2012. ^ "Selahattin Pural (Gazi) (Vefa) @". Mackolik.com. 1 January 1912. Retrieved 13 August 2012. ^ "Guillermo Ríos profile" (in Spanish). BDFA. Retrieved 26 October 2010. ^ "Ted Sagar | Everton Football Club". www.evertonfc.com. Retrieved 29 May 2018. ^ "Mehmet Salim Şatıroğlu (Galatasaray) @". Mackolik.com. 1 January 1910. Retrieved 2 October 2013. ^ "Mustafa Şenkal (Vefa) @". Mackolik.com. 1 January 1923. Retrieved 13 August 2012. ^ "Turgay Semercioğlu (Trabzonspor) @". Mackolik.com. 25 February 1954. Retrieved 13 August 2012. ^ "Kemal Serdar (Trabzonspor) @". Mackolik.com. 8 May 1962. Retrieved 13 August 2012. ^ "Hüseyin Seyid (Vefa) @". Mackolik.com. 1 January 1913. Retrieved 13 August 2012. ^ "Efsanelere Saygı Günleri Devam Ediyor". Galatasaray.org. 10 October 2011. Retrieved 30 June 2014. ^ "One Club Man Award". Athletic Bilbao. 22 April 2015. Retrieved 11 May 2018. ^ "Le Tissier in San Mamés". Athletic Bilbao. 29 April 2015. Retrieved 11 May 2018. ^ "Paolo Maldini at San Mamés". Athletic Bilbao. 1 May 2016. Retrieved 11 May 2018. ^ Lucas Navarrete (1 May 2016). "Paolo Maldini receives 'One Club Man' Award from Athletic Club". Marca.com. Retrieved 11 May 2018. ^ "Award to Sepp Maier at San Mamés". Athletic Bilbao. 14 April 2017. Retrieved 11 May 2018. ^ "Carles Puyol in Bilbao". Athletic Bilbao. 4 May 2018. Retrieved 11 May 2018. ^ "Celtic: Billy McNeill awarded Athletic Bilbao honour". BBC Sport. 16 April 2019. Retrieved 16 April 2019. ^ "Billy McNeill and Malin Moström, awarded by Athletic as One Club Awards". Athletic Bilbao. 16 April 2019. Retrieved 16 April 2019.